A new generation of smokeless, flavored tobacco products that look like breath mints or breath-freshening strips may be life-threatening for children who mistake them for candy, according to researchers from the Harvard School of Public Health and the Centers for Disease Control and Prevention (CDC). MONDAY, April 19, 2010 (Health.com) — A new generation of smokeless, flavored tobacco products that look like breath mints or breath-freshening strips may be life-threatening for children who mistake them for candy, according to researchers from the Harvard School of Public Health and the Centers for Disease Control and Prevention (CDC). “Nicotine is a poison, and now we're seeing smokeless tobacco products that look like Tic Tacs or M&M's, which parents can leave on the counter and children can be attracted to," says Greg N. Connolly, DMD, the director of the Tobacco Control Research Group at the Harvard School of Public Health, in Boston. Connolly led a research team that found that smokeless tobacco products are the second most common cause of nicotine poisoning in children, after cigarettes. The researchers reviewed data from 61 poison control centers and identified 13,705 cases of tobacco ingestion between 2006 and 2008, the vast majority of which were in infants. Smokeless tobacco was involved in 1,768 of the cases. 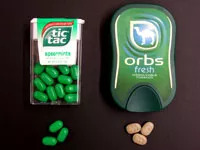 The new products—currently being test-marketed in three cities—include Camel Orbs, which resemble breath mints; Camel Sticks, which are about the size of a toothpick and dissolve in the mouth; and Camel Strips, which are similar to breath-freshening strips. Small, teabag-like "snus"—pouches filled with tobacco that are placed between the upper lip and gum—are also a potential hazard, according to the study, which appears in the journal Pediatrics. These products are not smoking cessation aids; rather, they are marketed as a nicotine alternative in places where smoking isn't allowed. Although children in the study were most often poisoned from eating cigarettes and smokeless tobacco products in general, the researchers single out the new, dissolvable products—especially Camel Orbs—as a "major concern." Orbs are available in cinnamon and mint flavors and could easily be mistaken for candy, the researchers say. R.J. Reynolds spokesman David Howard says that the packaging of Camel Orbs and the other dissolvable products is "100% child-resistant in accordance with Consumer Product Safety Commission standards" and bears a label that says "Keep Out of Reach of Children." Adults, he adds, should ensure that "children do not have access to any tobacco products—including dissolvable tobacco products." Still, the researchers say, the pellets could find their way into children's mouths. Nicotine poisoning can cause nausea or vomiting, and severe cases can result in convulsions, respiratory failure, and even death. Just under 0.5 milligrams of nicotine per pound of body weight is the minimum lethal dose for children, according to Connolly. A chemical analysis conducted by Connolly and his colleagues found that Camel Orbs contain an average of 0.83 milligrams of nicotine in each pellet. Some of the nicotine is “un-ionized,” which allows for more rapid absorption and may be more toxic than other forms of the drug, they write. “A small pellet with a rapid release of nicotine and a young child with a low body weight can be a very serious problem,” Connolly says. “We have to look at high-risk groups who may ingest these thinking that they are candy, and be very cautious about dispensing them and not leaving them around." To focus on the poison risk of Camel Orbs and dissolvable nicotine products is "remarkably selective," Howard says. He points out that Dr. Connolly and his colleagues make no mention of nicotine gums and lozenges used in smoking cessation, which are also available in a range of flavors and resemble candy and gum. In a commentary accompanying the study, officials from the Center for Tobacco Products at the Food and Drug Administration (FDA) write that dissolvable tobacco products "pose unique concerns for public health authorities." Marisa Cruz, MD, and Lawrence Deyton, MD, write that the FDA has requested research on the products from tobacco companies and will hold a series of public meetings to help develop a regulatory policy. The FDA has broad authority to regulate tobacco products under the Family Smoking Prevention and Tobacco Control Act, which was signed into law last June. Later that fall, the agency banned the sale of candy- and fruit-flavored cigarettes. “I would feel safer if the FDA…looked at the packaging [of these products] as well as their safety,” says Jonathan P. Winickoff, MD, an assistant professor of pediatrics at Massachusetts General Hospital, in Boston. While accidental infant poisonings are certainly cause for concern, purposeful ingestion of smokeless tobacco products by kids and teens may be a larger problem, Dr. Winickoff points out. As the study notes, the use of smokeless tobacco products among adolescents increased 6% per year from 2002 to 2006. One of the study authors, Terry F. Pechacek, PhD, the associate director for science at the CDC's Office on Smoking and Health, in Atlanta, notes that nearly half of first-time users of smokeless tobacco are under age 18.